I used this resource often when teaching reading in a Kindergarten classroom and referred this book to many teachers. The book is outlined to build one concept upon another, ranging from easy to complex, which allows the classroom teacher to differentiate reading instruction for a class, small group, or an individual. Each lesson focuses on word learning while reading, or writing. The book is designed to supplement, not supersede a reading curriculum. Each reading lesson in the book has the same format, which are teach, practice, follow-up and using what you know to link to the regular reading and writing lessons happening in the classroom. Personally, I have used the lessons at different times of the year to reinforce the learning in reading and writing to compliment my instruction. I have also modified the lessons based upon the developmental needs of the students. The book is best described by it’s title, lessons to learn words, make words, and sort words. Basic sentence structure and what is a word. When teaching concepts of print, students will receive several lessons on what is a word and how to count the number of words in a sentence, how to sort a letter, number and word, how to sort short and long words, how words have different letters, and how many letters are in a word. Learning word wall words. 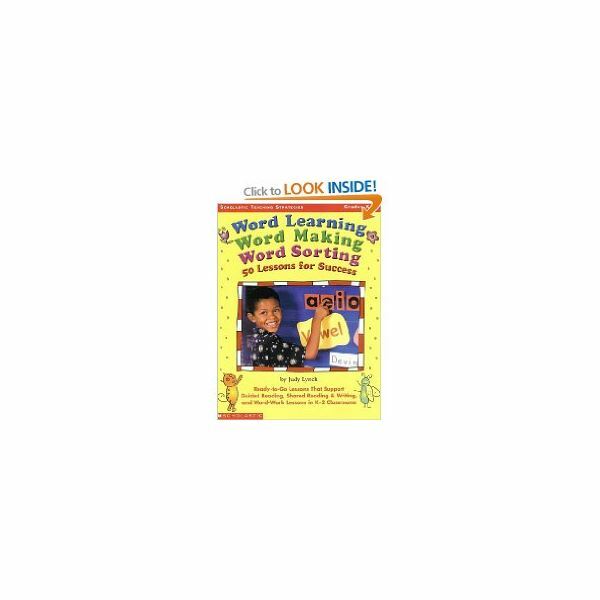 Lesson plans for building words, memorizing words, creating a word wall, and sorting high frequency words are all included. Learning word parts. Here students take a closer look at initial and ending sounds, an alphabet chart, capital and lower case letters, matching words and pictures. As the students progress in their curriculum, they can receive lessons in word endings, suffixes, word chunks, and a comprehensive vowel study. Printable sheets with words or letters. Individual sorting maps (to support the lesson). A color poster of the alphabet (phonics) chart for the teacher. A color poster of a chunking words chart for the teacher. A black and white poster for students to guide them to look “through” a word to read it (fluency). A resource guide to 1-800-numbers and websites to order wikki sticks, pocket charts, highlighter tape and so on. The books is currently available used. Below is an outline of some of the reading lessons that I have prepared for this series. Come back and browse again, as more are likely to be added. I have many more in other reading series that I cannot include here. Click on my name to read more, if interested.